I went with 2 dishes — both within my comfort zone, but both very traditional to the region. 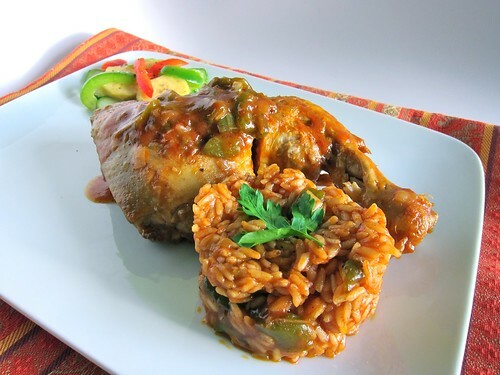 Chicken Jollof is a stewed chicken and rice dish, much like the Doro Wat from Eithopia (a dish I did during our 2009 culinary tour). Or you might even liken it to arroz con pollo (although very differently spiced). Imoyo is a plantain salad similar to an escabeche. Let’s have a taste of Nigeria, shall we? 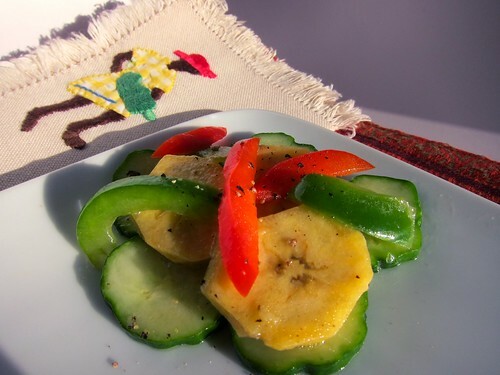 Plantain Salad Imoyo is boiled plantain, cucumbers, garlic, red + green peppers, garlic, evoo + fresh lime juice. “The disobedient fowl obeys in a pot of soup.” Nigerian saying. 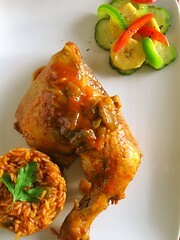 Chicken Jollof is chicken and rice that is stewed with vegetables, tomatoes and spices. It is said that curry was brought to Western Africa, particularly Nigeria, during the age of British Colonialism. It seems officials who had been stationed in India and acquired a taste for curry took it with them when they were transferred to Africa. Between you and me. I’ve enjoyed all the aromatic spice blends that I’ve used over the past 7 weeks while we made dishes from Thailand, Egypt, Japan etc., but I must admit to a little traveler fatigue. Between virtual and actual travel these past 2 months, I’ve put on a few extra lbs. and my tastebuds are longing to return to my more familiar FOODalogue fare. The aromatics emanating from these type dishes, especially those with curry, are intoxicating…but they also tend to linger just a little too long. My house was just getting over the scent of Ras el Hanout from the Egyptian dinner when I made this meal. I think it took 2 days before I stopped smelling curry every time I walked in the door. It’s good to be food-literate and explorative of new cuisines. To enjoy them every now and them. That’s the beauty of this event. AND, it’s good to return your standard fare…that which gives you comfort, that which your tastebuds and your olfactory senses readily embrace. We will end this tour on Wednesday, March 2, with the bloggers’ round-up of Nigeria and a special farewell message. See you there. Don’t hear much about Nigerian cuisine do ya? That chicken looks scrumptious! Jollof is such a classic – delicious. I bet your house smells pretty good! Love those spices and curries – gorgeous color. Great to learn about Nigerian cuisine and these specialties look very tasty! Again, you outdid yourself. reminds me of my Arroz con Pollo. I found this tour so difficult but, as usual, you pulled it off. Nigeria has been a challenge but you came up with 2 delicious dishes Joan that ended your tour off with a bang!!! It has been a pleasure to travel the world with you in these past 7 weeks. Nice to read about Nigerian cuisine Joan…you should be applauded for your efforts though overall! Well done! That chicken looks very tasty to me; I can sense a spice overload in your last paragraph and think maybe it would behoove you to promote English fare now! 🙂 Take care! Thanks Joan for raising the profile of my homeland. What I strive to do….but perhaps not enough. And I agree with you, one does get traveller weary but with it is the knowledge (and comfort) of having grown, mind and hips broadened….Time for refreshing…. That looks all very deli! I definitely have to try the plantain salad. 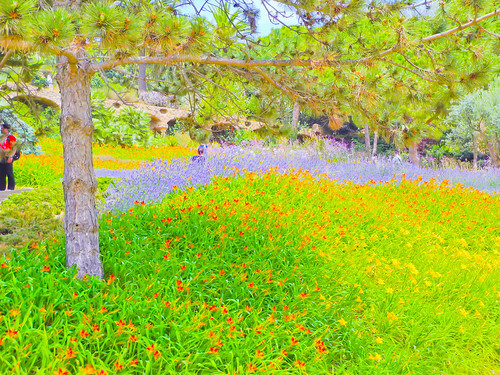 It is so colourful and plantain is something I want to explore a bit more in the future. Thanks again for taking us on this trip. It was eye-opening, mind-opening and above all … jolly good fun. Hi Joan – such a vibrant dish. I really like that plantain salad, and your cute napkin. It’s been quite a tour, kudos to you! Interesting! 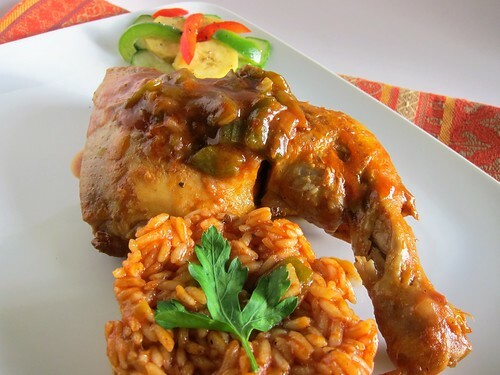 I never heard of Chicken Jollof… sounds juicy, aromatic, just the right amount of spice…I will definitively travel virtually to Nigeria next time I get some chicken. 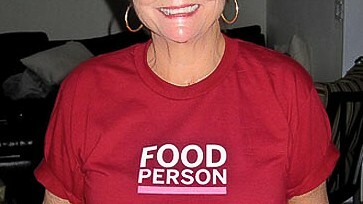 I really love how you transport us all over the world with your “culinary passport”!!! 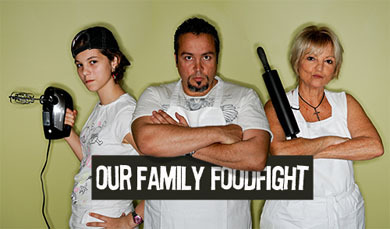 I just read Oz’s post and this is a country with FLAVOUR in their food. A very interesting cyber trip, I must say. One of my favourites so far. My husband would eat nothing so exotic so I am truly deprived at times, by his bland Eastern European palate – but I do go out and also cook for my girl friends. Dishes like this make my heart sing – but I can understand that you might need a very strong fan over the stove, or that cooking outside is a good idea!